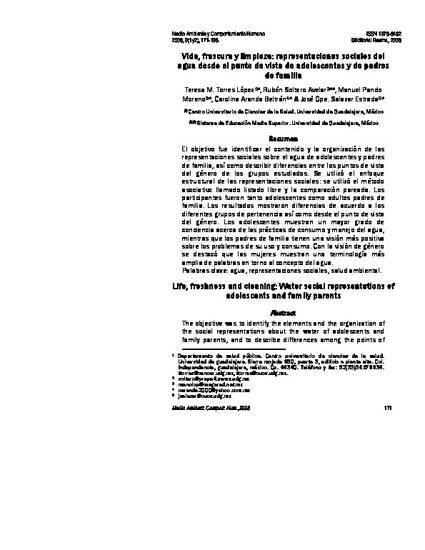 The objective was to identify the elements and the organization of the social representations about the water of adolescents and family parents, and to describe differences among the points of view of the gender of the studied groups. The methodology was structural focus of the social representations: it was used the method associative of free listing and the paired comparison. The participants were adolescent and the family parents. The results showed differences according to the group age of adsorption and to gender point of view. The adolescents show a great concern about the use and consumption practices of the water. The family parents have a more positive vision about the problems of water use and consumption. About of the gender the women show more variety of words around the concept of the water.